Natural disasters are rapidly occurring with increased intensity that has never been recorded before…tornadoes,earthquakes, hail storms, tsunamis, and hurricanes of late have been unprecedented. Tens of thousands of lives have been changed forever in just a matter of moments. With the same intensity, spiritual darkness has rapidly infiltrated the Church, the Messianic Hebrew Roots Movement, and Judaism as well. Did you notice that I didn’t include any of the other “isms” that we know to be off track? Yes, those considered “main stream” today, are being bombarded with a myriad of thoughts,ideas and opinions about the Father’s Word—that are not His Words. False doctrines are surfacing so rapidly that it is becoming quite daunting to find the “razor’s edge” truth. Weeding through all of the spiritual clutter to find the truth can be particularly difficult if one does not have a solid Scriptural foundation or a familiarity with the origins of certain teachings. Everywhere you turn there is a “NEW” teaching that sounds good…at least on the surface…it tickles the ears…but when you dig a little deeper, many times you’ll find that these teachings don’t come close to lining up with Scripture. Although they may contain a “measure of truth,” at best they are a mixture that leads to lukewarm-ness in the Holy One’s eyes. It’s called syncretism, the meaning of which is: “Reconciliation or fusion of differing systems of belief, as in philosophy or religion, especially when success is partial or the result is heterogeneous.” It’s a MIXTURE! None of these lukewarm (false) doctrines and teachings are new. We know from Scripture that “…there is nothing new under the sun” (Ecclesiastes 1:9). They are just a re-make of the same old lie with a different twist – made to deceive “if it were possible” even the very elect. 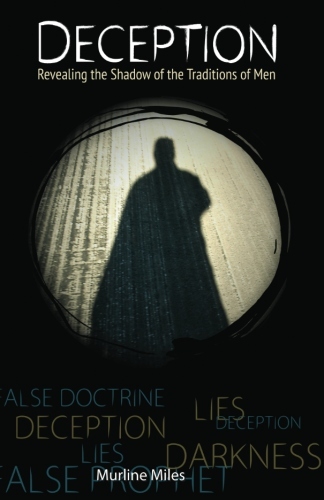 For more, order Murline's new book titled, "Deception - Revealing the Shadow of the Traditions of Men.